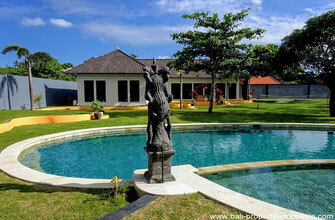 On this page you will find a directory of our properties on offer for sale in Canggu. To go to the page of the property of your interests, please click on the pictures of that certain property or click on the button that says “More information”. Very large townhouse for sale with 3 bedrooms, located in Berawa/Canggu. A townhouse offered for sale with a freehold ownership title. A townhouse which is only about 800 meters away from Finns Beach club and the beach. Modern minimalism Umalas villa for sale. Located in a secured complex of 10 villas. Each villa is consisting of 3 bedroom with en-suite bathrooms. A perfect place for your residential living or renting out the villa. You are looking for a villa with nice views. However, you also want to have a spacious place to live? We found this place for you with this villa. Modern luxurious apartments for sale. Located on a short walk from the beach and surrounded by rice fields. You can use these apartments for permanent living or you may join the rental pool to obtain a good ROI. Nice and cozy family home for sale in Tiying Tutul. A spacious villa with 4 bedrooms and a large open living area. The swimming pool is completing this attractive villa. Are you having a limited budget or you don’t want to spend too much for a house in Bali? Then this 2 bedroom home in Buduk can be a good option for you. This villa is located in Tiying Tutul, situated at the end of a small alley. You will be surrounded by many trees. Quiet relaxing area still nearby vivid Canggu. Colonial villa for sale with 3, possible 4 bedrooms. Located on a 5 minute walk from the nearest beach and Finn’s Beach Club. A villa in which the colonial times revive. This 3 bedrooms villa is located in the heart of Canggu, right across the Canggu Club. The villa is having a view over some rice paddies in front of the villa. Are you in the market for a 2 bedroom villa? Then we can offer this modern open Kerobokan villa. You prefer a 3 bedroom villa, possible as well with this villa. This villa has a very large walled garden. A safe place to have your kids running around to play or space to add some more buildings. Almost 24 are and 3 bedrooms. This luxurious 3 bedroom is located in Babakan, a village just North of Batu Bolong and Echobeach. A modern contemporary villa for sale including an open piece of land. 4 bedroom villa on offer for sale. Located on a walking distance from the beaches and trendy Finns Beach Club. Long lease until 2046. This villa has been built on a prime location.... just about 15 minutes walking from the nearest beach in Berawa and not to far from popular Finn's Beach Club. This is a brand new villa for sale in Berawa. A perfect comfortable family home not to far away from schools, restaurants and of course the beaches. This exceptional resort is for sale. A unique place to run your business. Running a business like a resort, yoga, spa, or sport resort. All is possible. Modern three bedroom villa in Canggu with swimming pool for sale. This house offers you a good location for residential living or eventually for renting out. Spacious modern 4 bedroom villa, located approximately 500 meters from the Batu Bolong beach better known as Echo Beach. A very long leasehold until 2061. 2 Neo classical almost identical villas for sale in Berawa. Located on a short walking distance from the beach and Finns Beachclub. Many times people who are looking for a villa come to the point that they also can built their villa themselves, sometimes an opportunity comes that you can do both. This Babakan villa is offering various choices : You can choice for a leasehold or a freehold title. Or you can use it as a 2 bedroom or a 3 bedroom villa. Pererenan boutique hotel for sale, just about 200 meters from the beach. An hotel with 7 rooms and yoga facilities. Possible to create extra rooms.